A cold day and excellent groomed slopes and it is mid March. Certainly it was not spring skiing. What a bonus to have such excellent conditions for this late in the ski season in upstate New York. We even had a bit of sunshine early in the day but unfortunately the light failed later. As I write we are receiving a dump of new snow and if the forecast holds we should have four to six inches for tomorrow's runs on the local slopes. The skiers on the slopes this morning were predominantly geezers. The general public was obviously gainfully employed and absent. Thank heavens for the working folks continuing to fund our social security! 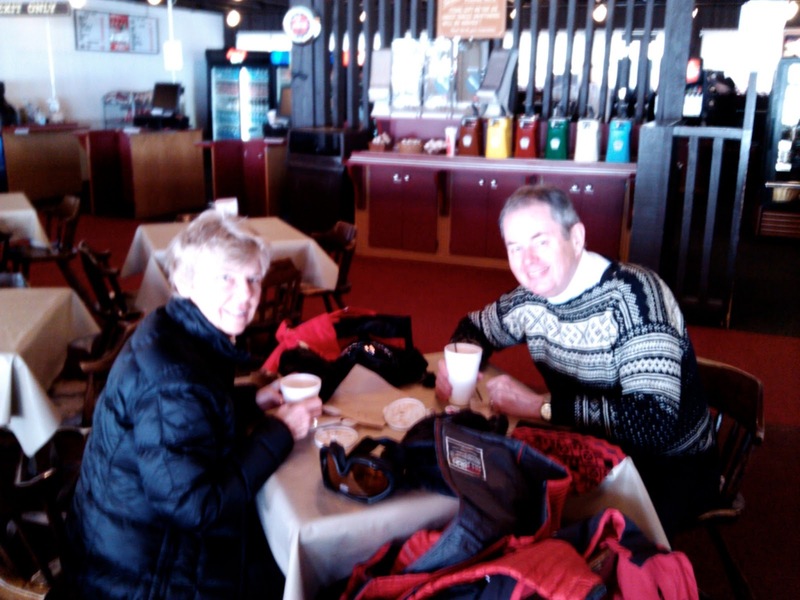 Although the skiing conditions were excellent, a coffee break after an hour or so in the cold was appropriate. We had more than a quorum this morning. We even needed to pull two tables together to provide enough seats. See photos. Conversation was lively and the stories swirled from one side of the table to another. It is notable that when the number in the group exceeds four or so, that multiple stories are in progress simultaneously. The groupings are fluid much like a school of fish that coalesces and breaks up as they swim in the sea. 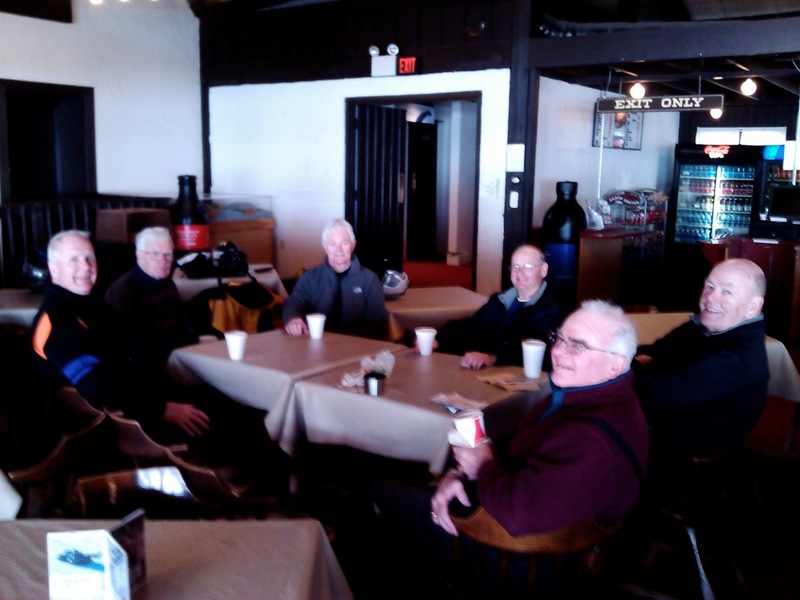 As the story telling wanes the group breaks up and we adjourn to the hill for another round of skiing. Other geezers have remained on the hill and when we encounter them we get the usual chiding for taking time for coffee. See photo. However, I think I make up for that by staying past the lunch hour and even taking a shot at skiing Hercules. Greek Peak geezers will understand the significance of doing Hercules. Most of the time this slope is closed or covered with an ice face. Not so today. The Stalwarts Staying on the Hill - Cliff, Pat?,?, Pret and ? Here is hoping that Spring on the slopes will be delayed for another week or so. 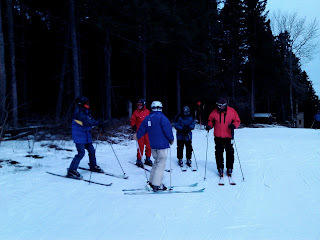 For the non-skiers hoping for an early spring, your days will come and don't curse the skiers and the weather too much. April and the tulips are coming!